Horse Sense of the Carolinas is an internationally recognized leader in the field of Equine Assisted Therapy and Learning. Horse Sense also helps other professionals offer top-notch programs to their communities through training, consulting, immersions, curricula, session tools, books, and more! Our staff is made up of professional therapists, trained equine specialists and creative thinkers. Contact us here! Shannon Knapp, M.A., is founder and president of both Horse Sense of the Carolinas, Inc., an internationally-recognized leader in the field of Equine Assisted Psychotherapy and Learning, and Executive Director of Heart of Horse Sense, a nonprofit dedicated to supporting professional Equine Assisted Therapy and Learning for Veterans and At-Risk Youth in WNC at no cost. Shannon has also published many books and curricula in the field of EAP/EAL, including More Than a Mirror: Horses, Humans and Therapeutic Practices. Shannon is a trainer for Trauma-Focused Equine Assisted Psychotherapy, is EAGALA Advanced and has an EAGALA Military Individual designation, is Associate Faculty for Prescott College’s Equine Assisted Learning Masters Concentration program and also for Warren Wilson College. A professional in EAP/EAL since in 2001, she has thousands of hours of client contact in EAP/EAL with a diverse range of diagnoses. Talia Aguayo is a fully Bilingual (Spanish and English) Licensed Marriage and Family Therapist. Talia has provided services to Individuals and Families of all ages, struggling with all sorts of challenges such as adjusting to life’s stressors or changes, depression, anxiety, grief, behavioral issues, low self-esteem, poor decision making skills, and poor communication skills. Talia combines different models such as Solution Focused, Motivational Interviewing, Cognitive Behavioral Therapy (CBT), and Narrative Therapy to provide the best services for her Clients. She is Trauma-Focused EAP Certified and has completed the Fundamentals and Intensive training in Trauma-Focused Equine Assisted Psychotherapy through Natural Lifemanship, is EAGALA certified and EAGALA Military Individual designated. Jake LaRue is a Certified Peer Support Specialist and an equine specialist. He is a Marine Corps Veteran who served with a Tactical Air Control Party during Operation Desert Shield and Desert Storm. Jake grew up in Dania Beach, Florida and traveled extensively both during and after his active duty enlistment, ending up in Asheville, North Carolina. He became interested in equine therapy after meeting Horse Sense president, Shannon Knapp at a meditation retreat in 2013. Equine therapy was so impactful on his life that he chose to pursue it as a career. Jake has been trained in Trauma-Focused Equine-Assisted Psychotherapy and Learning. He facilitates a weekly “Fall in Friday” group for veterans and their caregivers and serves as an equine specialist as a member of individual treatment teams. Jake’s own journey of recovery and self-discovery provides a unique perspective to the Horse Sense herd. 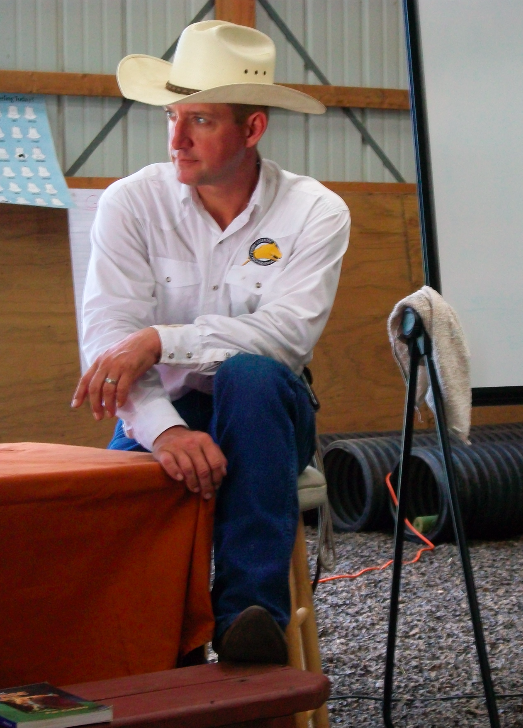 Richard Knapp is an EAGALA-certified practitioner, has completed the Fundamentals and Intensive training in Trauma-Focused Equine Assisted Psychotherapy through Natural Lifemanship, a Parelli Level 3 graduate, and a Parelli Instructor. A Northern Ohio native, Richard graduated from the USAF Academy in Colorado Springs with a BS in Space Physics. After graduating from Pilot Training at Reese AFB in Lubbock, TX, he served as a flight instructor, air traffic controller, and FAA liaison, completing his military career in 1993. He worked as a contract software designer in Dallas, TX, &. now manages Meadows Town, LLC, a business for horse rehabilitation and development, instruction, and sales of Advanced Biological Concepts feed and supplements, Flint River Ranch organic dog & cat food, and organically grown hay. He is also a horse professional assisting and teaching in many of the Veterans groups.